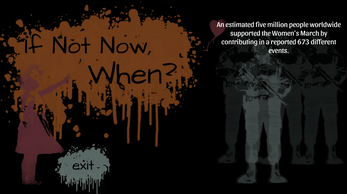 Made for the March 2017 Resist Jam, If Not Now, When is a PC based simulation game that puts the player in the chair of managing a protest. 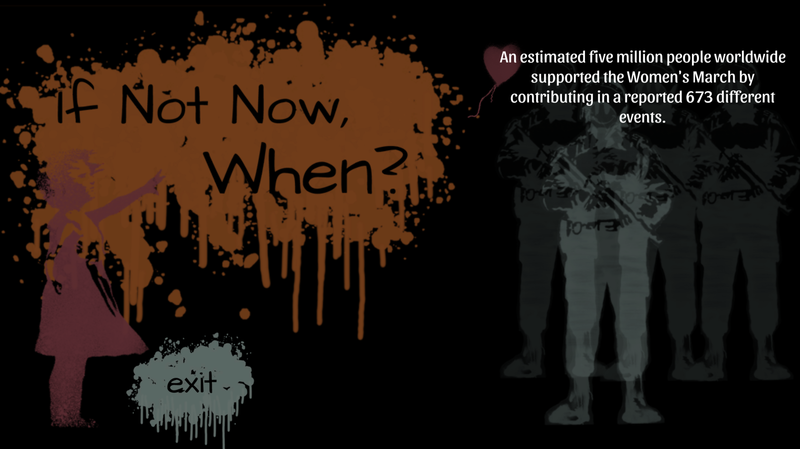 Thrust into events not dissimilar to Tahrir Square, the Protests in Ukraine, Arab Spring, or Occupy Wall Street, players are faced with decisions about what to say and do, resources to prioritize, and choices to make. All while a corrupt, and often openly hostile government looks on. 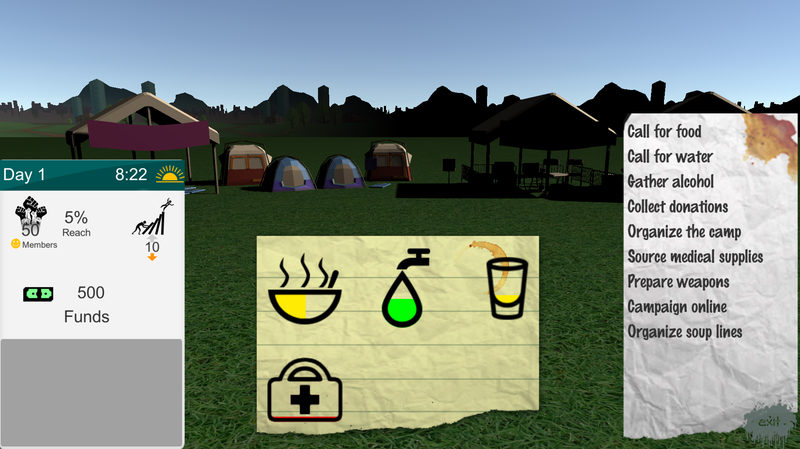 INNW is a simple resource management game. 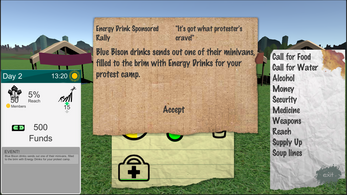 Once you are in the main screen, you will see a list of actions on your right. 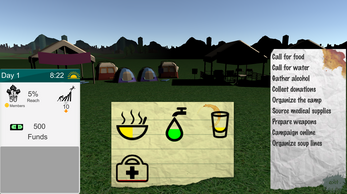 At the bottom of the screen are resources, Food, Water, Alcohol and Medicine. On your 'phone device' on the left side, are more indicators such as your camp population, your influence, and your social media reach. Your amount of cash on hand is also there. The game is broken into days, split into time intervals. You can do one action each Morning, Afternoon, Evening and Night. Some intervals however will also have an event. Events occur all the time, so pay attention. Sometimes they may just have a direct impact on your resources, or your indicators, but sometimes they will also ask you to make a choice about the direction your protest is going. Your camp is at a local level to begin with, but after 10 days, it will progress to becoming influential on the City itself, and after that, on the State. If you can keep your Camp running for 30 days, you will get to see how well you did and if your protest truly takes hold. Great work on this game. I enjoyed seeing the camp grow. Unfortunately, on the final choice, the game doesn't seem to let me select anything. I tried clicking the choices but it did not respond to the clicks. The only thing that would respond was the exit button. (I'm was playing the Mac build, on macOS Sierra 10.12.3) If have a new build and need someone to test on Mac, let me know. Yes, thank you Andyman404, I just realized that the mac build wasn't updated with our actual submission build. That build was about 4 hours before deadline and has an error with the 'ending' of the game. I'll let you know when we get our mac build updated! Unfortunately only one of our team can build to mac :) Thanks for playing either way though!